Diving, camaraderie, chilling and soaking in the Andaman way of life – Barefoot Scuba is all that you need when you holiday on the island. Not even a day on Havelock, and you’ll be chilling like you were born to. Or at least I was. And encompassing everything that the laid-back isles are is Barefoot Scuba Dive Resort. Set on Beach No.3 in Havelock, the resort is great for those travelling on a budget and want to blow up their money on learning how to dive. But if you’re not holding back, then there’s enough accommodation options for you too. For the real rustic feel, pick the frame huts that are just that – little huts on stilts with a bed, fan and mosquito net. There are communal bathrooms for those who live in these, so if you’re fussy, then pick something else. We love the Tented Cottages, though it can get warm without an air-conditioner, but since there’s always a breeze, it’s not too bad. Basic but comfy, we say. It really gives you the feel of being an islander — perfect if you’re heading over for a long stay. But, throw in the sea view cottages and it changes the equation a bit, because well, who can say no to waking up to pristine blue waters? Made out of bamboo, the bungalows even have a balcony on the upper floor for unobstructed views. Need fancy? No sweat, opt for the air-conditioned wooden cottages that are perfect to soothe your muscles after a long day at sea. 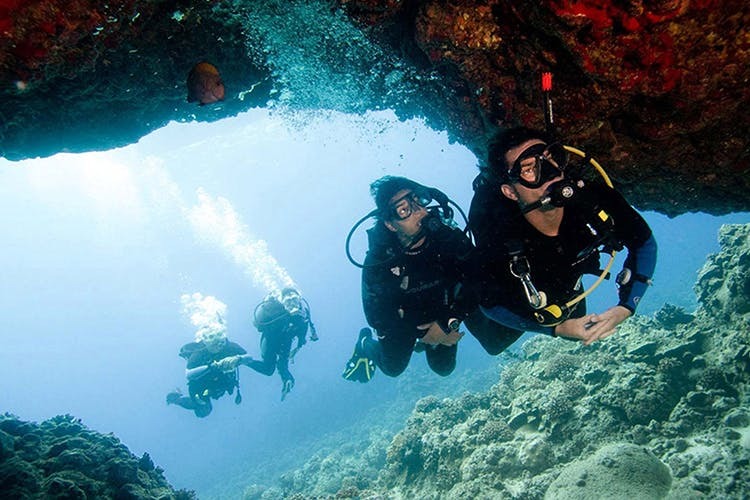 Barefoot is the only PADI (Professional Association of Diving Instructors) Instructor Development Dive (IDC) Facility in the Andaman Islands, so you can start with fun dives, graduate to open water divers and get as serious as a rescue diver. It’s really something else when Manta Rays, Devil Rays, White-Tip Reef Sharks and even turtle comes swimming alongside you. Make sure to buy an underwater camera for this trip.